If you were going to set up building sports cars, what do you reckon your priorities would be? Sleek, swoopy styling? For sure. Big power and neck-snapping acceleration? Definitely. But what about safety? Well, sure, it's important obviously, but if you want a safe car you'll buy a Volvo, right? And Volvo haven't made any swoopy, quick sports cars. The 480 and P1800ES do NOT count. Malcolm Bricklin saw this gap in the sports car market in 1974 when he launched the Bricklin SV-1 (SV standing for "Safety Vehicle"). He set up as the importer of Subarus into the USA, and when he sold his share the money was put into his sports car project. It was manufactured in Canada and wasn't a great success, build quality problems and supply difficulties causing trouble for the fledgling company, and when sales ceased in 1976 just 2800 or so had been built. It looked fabulous from a distance, but get close up and the gullwing doors have an atrocious fit, shutlines are massive and uneven, and there's a distinct kit-car air to the whole vehicle. A deserving mention here for RNJ Motorsport. 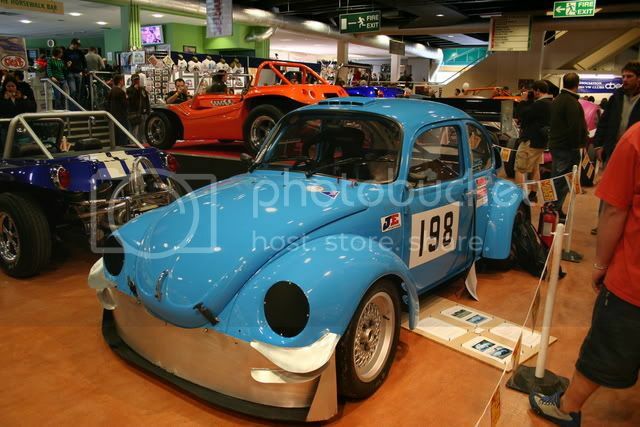 Rob of RNJ specialises in aircooled Volkswagen performance tuning, vehicle restoration and rebuilds. He also deals with just about every other retro marque and model too. You can visit his web page here. Rob competes in the Aldon Hillclimb championship with his 1303 Beetle, and his engine preparation skills have been put to good use in the VW Samba of Abigail Tether, currently running low 17-second quarter miles in the VW Drag Racing Club Championship.